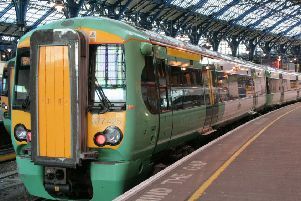 A Brighton communications company has created a campaign warning teenagers of the risks around railway lines. The life-saving campaign by Pegasus launched this week, and revealed that one teenager risks their life on railway tracks every four hours. It was created in partnership with Network Rail and British Transport Police. Chris Webb, director at Pegasus, said: “We’re very proud of our work to create the ‘You vs. Train’ campaign for Network Rail and the British Transport Police to raise awareness of this important issue. “We’re focusing on targeting boys aged 11-18 years old through a mixture of channels, including Instagram, Snapchat and even cinema advertising. Network Rail said figures show more than a quarter of teenagers (27 per cent) confess to behaving in a way that could endanger their life on the railway. One in 10 teenagers admitted to walking along the railway line – more than two fifths of those (42 per cent) in the last year. The number of young people taking risks on the railway track has gone up by almost 80 per cent in the last five years, Network Rail said, and in the last 12 months alone, seven young people under the age of 18 have lost their lives. A further 48 people have received life changing injuries. As a result the rail industry and the British Transport Police have launched a new campaign – called ‘You Vs Train’ – which targets teenagers to make them face the serious and devastating consequences for them and their loved ones when they make the potentially life-changing decision to ignore warnings and go onto the railway, with its obvious and hidden dangers. At the heart of the You Vs Train campaign is the story of Tom Hubbard – a young boy who suffered life-changing injuries in 2014 when he was electrocuted by the overhead power cables. Tom suffered third degree burns across 57 per cent of his body and he has been left to deal with the serious physical and psychological consequences ever since. He said: “I woke up 11 days later in the burns unit at Birmingham’s Queen Elizabeth Hospital wrapped from head to toe in bandages, heavily medicated and unable to string a sentence together. I don’t think I knew what was real and what wasn’t. When the doctors and my mum came to speak to me a few days later, the enormity of what had happened finally hit me. They explained how lucky I was to be alive, but it was going to be a long road to recovery. A short film reenacting Tom’s story was launched across social media this week. Tom’s family will also feature in the campaign to show how Tom’s accident has impacted them.